What Sharks Are on the Coast of Washington State? According to the Shark Foundation, a nonprofit organization founded in 1997 to help protect and preserve shark species, the coast of Washington state is home to 30 shark species of various sizes, all of which serve different functions in their local ecosystems. A few of the species living in this portion of the Pacific Ocean may represent a potential danger to swimmers; however, the vast majority of the native species are not dangerous to humans. Tiger sharks (Galeocerdo cuvier) and great white sharks (Carcharodon carcharius) are the two largest predatory species in the area. Reaching at least 20 feet in length, great whites predate heavily on marine mammals, including seals, dolphins and whales. According to the Shark Research Committee, which was formed in 1963 to record and document shark attacks on the Pacific coast, the only authenticated shark attack in Washington’s history was a nonfatal attack on a surfer in April of 1989. Tiger sharks reach nearly similar lengths as great whites do, but they prey on a wider variety of species, including turtles, birds and fish. Salmon sharks (Lamna ditropis) and dusky sharks (Carcharhinus obscurus) do not grow quite as large as tiger sharks or great whites, but the Shark Foundation warns that these 8- to 12-foot-long sharks are potentially dangerous to humans. Newborn salmon sharks frequently wash up on shore during the late summer. Perhaps the most abundant and well-studied shark species in the world -- the spiny dogfish (Squalus acanthias) -- is a sluggish bottom-dwelling species that reaches about 3 feet in length. Several deep-water cat sharks (Apristrurus sp.) inhabit the waters off the coast of Washington. All cat sharks are small, poorly known bottom-dwellers of deep water. Only reaching 4 or 5 feet in length, leopard sharks (Triakis semifasciata) are harmless. Leopard sharks develop slowly, and may take more than 10 years to reach maturity. Small tooth sand tiger sharks (Odontaspis ferox) live near the bottom and prefer deep waters near the continental slope. Presumably, these 9-foot-long sharks eat fish, though scientists do not know their diet with certainty. Blacktip sharks (Carcharhinus limbatus) average less than 6 feet and consume fish and small sharks. Blue sharks (Prionace glauca) are medium-size fish who reach about 9 feet in length. Though they typically live far from shore in the open ocean, they may be dangerous to humans. Approaching 40 feet in length, basking sharks (Cetorhinus maximus) are the largest sharks found along the coast of Washington; fortunately, they are primarily filter feeders who do not view humans as a food source. Occasionally, basking sharks form large groups of up to 100 individuals. Scalloped (Sphyrna leweni), bonnethead (Sphyrna tiburo) and smooth hammerheads (Sphyrna zygaena) inhabit parts of the Pacific Ocean near the state of Washington. 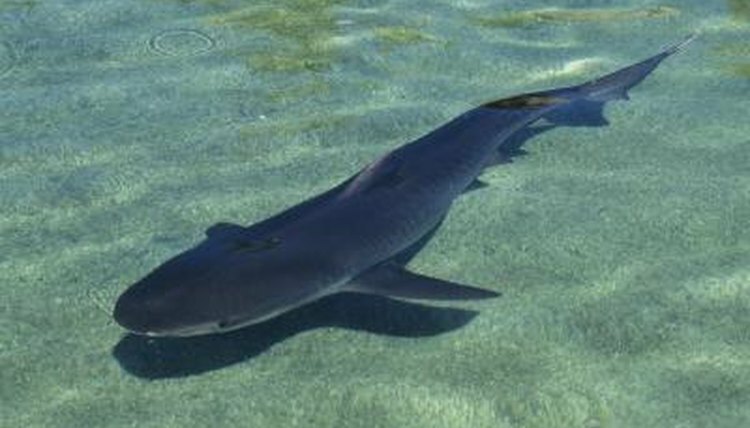 While bonnetheads are harmless to humans, scalloped and smooth hammerheads may be dangerous to swimmers. Thresher sharks (Alopias vulpinus) use their incredibly long tails to herd and stun their primary food, small bait fish such as sardines and anchovies. Even though these fast-swimming sharks may reach nearly 1,000 pounds in weight, they are unlikely to harm humans. Pacific angel sharks (Squatina californica) are flat bottom dwellers. They are essentially harmless, but you should avoid contact with them if you encounter them.